Chillies are at their best in Autumn. I generally never waste produce and when friends give me some of their fresh seasonal crops I get enthusiastic and active. These chillies were grown in Adelaide and this time I decided to make a chili paste that was not Harissa. I have been making Harissa for a very long time since one of my Sicilian relatives who lives in Augusta introduced me to it about thirty five years ago. 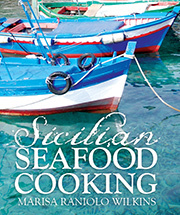 Augusta is in south eastern Sicily and is an important Sicilian and Italian naval base and trading port. Giacomo is a mechanical naval engineer and was often called out to work on naval vessels in the gulf, some vessels were from Tunisia, Algeria and Libya and he was introduced to this hot chilli paste through his contacts. There are many recipes for this paste and it is an important condiment in Middle Eastern Cuisine. Some make it with dry chillies, some with fresh chillies and some with roasted chillies. I usually use cumin and caraway seeds and garlic when I make it. I use Harissa in many ways and always to accompany cuscus. I also like to make Salsa Romesco , a condiment popular around Barcelona in north-eastern Spain. Like when making harissa there are many variations to recipes but this condiment is commonly made with red peppers, garlic, tomatoes, white bread and almonds. Sometimes I have roasted the peppers and added some roasted chillies as well. Crema di Peperoncino is a chilli paste that is very popular in Calabria. It is usually made with fresh chillies , salt, garlic and olive oil. I thought that would combine my experiences for making Harissa and Romesco and make a roasted chili paste. No spices, just chillies, salt, garlic and extra virgin olive oil – Crema di peperoncini. Isn’t that what cooking is all about? I kept is very simple. I could have made a milder paste by adding some ordinary red peppers which are also very much in season but I decided to just keep the Crema di pepperoncini hot, hot. hot….And it was. I used the other red peppers in a salad. The photos demonstrate what I did. Use any type of red chillies that you have. INGREDIENTS: red chillies, garlic to taste, 3-4 tablespoons extra virgin olive oil, teaspoon of salt (preservative), more extra virgin olive oil to place on top. Grill/ Roast the chillies on high heat. Turn once until blackened and charred all over. Do the same with unpeeled garlic cloves. Remove the skins and seeds – you can leave some seeds if you would like it hotter! Place in a sterilized jar and top with a layer of more oil to seal. I keep my jar in the fridge and make sure that each time I take some out of the jar I replace a layer of oil on top (to stop mold). I always know when it is picking olive season by the number of people looking at the posts on my blog about pickling olives. Yesterday there were 162 people looking at How To Pickle Olives, the day before there were 188; I can only assume that these readers are living in the southern parts of Australia and some maybe from New Zealand where olives are in season. I have written about olives in a number of posts but this one seems to remain the most popular. Rather than write about olives again I will have links to other posts about olives and include a few photos of how I am processing olives at the moment. In the photo below the olives in the jar are from my tree on the balcony – slim pickings this year. These small olives have been placed in vinegar, extra virgin olive oil and salt. In the colanders below are olives that my friend collected from her tree. I have separated them into green olives (unripe) and violet olives. I am making the green olives into cracked olives (Olive Schiacciate). The photos explain how it is done. In this process the stone must be removed. Some suggest using a rolling pin. My father used to use a stone or a wooden mallet. I have placed the olives on my pastry mat and then folded it over. You will need to apply quite a bit of pressure. I usually use a meat tenderizer . On this occasion I used a rolling pin and then finished them off with a meat tenderizer – take no prisoners! Olives can be very beautiful. I place the cracked olives in a large jar and cover them with plastic netting to keep the olives submerged. I will keep on changing the water for about 7 days. The water is quite cloudy and I wonder how much goodness will be left in the water. After 7 days the olives are ready. There are not many there. You can see that I am soaking the black olives in water. I will change the water daily for about 10 days and then place them in brine. It is also worth reading some of the comments from readers on HOW TO PICKLE OLIVES. Some of the most popular posts on my blog are about pickling olives or how to dress them once they are pickled. And I have also had many conversations with people about how to pickle olives so it is time to reveal another pickling method that has worked for my olives for the last couple of years. I have to say that my olives are small in size and if your olives are larger, this pickling process may take a much longer time. What you could do, is put a split on the side of each olive – this will assist the pickling process. My tree is in a large pot on my balcony and I bought is from a plant nursery where it was labelled as a Paragon olive tree – it would be called a Frantoio olive tree in Tuscany. Frantoio (Paragon) olives are small and oval in shape and they are mainly used for extracting oil. In the photo below the Paragon olives are on the left and Kalamata olives are on the right. A ‘Frantoio’ is also the hydraulic press used to extract oil and the processing plant or factory is also called a ‘Frantoio’. The color of an olive is an indication of its ripeness. Green olives ripen and go from green to light brown and purple, to black. If I am using brine (salt and water) I pick the olives when they begin to turn from green to violet and I go through the usual process of keeping them submerged in a bucket of water and changing the water every day before I place them into brine. Because olives do not all ripen at once I may need to pick the olives in stages and follow through to the pickling process in batches – I cannot say that it is one of my favourite occupations. However for the last couple of years olive ripening time has coincided with travelling and not wanting to waste the olives I have collected them all at once – green, purple and black – I eliminated the process of the changing of water and all the olives went straight into pickling using water, salt, wine vinegar and extra virgin olive oil. And this process has worked (for the past two years). The olives are probably more bitter than previous years but I do not mind that at all. I usually leave them about 5-6 months before I eat them. Every two years the tree produces a large crop and I may collect about 2 kilos of olives. I pickle my olives in a crockpot which I leave on my balcony (there is no room for a crockpot inside my small apartment). When they are ready I transfer them to jars and add fennel seeds and dry oregano to them. Notice that there is always oil on top and that the olives are submerged. There are various other ingredients that I add to olives when I dress them (See my other posts about olives). Wash and drain the olives and place them in a clean glass jar; I use a crockpot. Boil the water and add the salt – make sure that it is dissolved. The way to test if the water is salty enough is to float an egg in the water and if the egg’s surface remains above the water, there is enough salt in the water. If it sinks add more salt. Wait till it is cool. Add the vinegar and cover the olives in the jars finishing with a good layer of olive oil to seal. Use some mesh to keep them submerged – they must be covered. Set aside until the olives are ready. Helping my mother to make Insalata Russa was my job throughout my childhood and teenage years. It was a legacy from Trieste and a reliable appetizer served on special occasions. She kept making it well into the 80s and then it would re-appear intermittently throughout the years. She would present it before we would sit at a table for a meal, as a nibble… she would pass around a spoonful of Insalata Russa on a slice of bread from a French stick. Those of you who are of a certain age may remember Rosso Antico (a red aperitif) or a Cinzano (vermouth) or a martini. Sometimes it would be a straight gin with a twist of lemon. Today you may prefer a different aperitif like Aperol or a glass of Prosecco or a Campari – you get the idea! It keeps well in the fridge and is an easy accompaniment for drinks – I am thinking of those unexpected guests who may pop in …. a drink, a small plate of Insalata Russa and some good bread. If my mother was still alive she would probably be making it on Christmas eve or Christmas day. Insalata Russa is made with cooked vegetables: peas, green beans, carrots and potatoes cut ino small cubes and smothered with homemade egg mayonnaise. She always decorated the top with slices of hard-boiled eggs and slices of stuffed green olives. Sometimes she also placed on top small cooked prawns or canned tuna. ***** Modern Times…..Try it sprinkled with Yarra Valley caviar (fish roe) instead. Ensaladilla rusa is the Spanish version of this salad and it is a very common tapas dish; It was certainly still popular as a Tapas in Madrid and Barcelona when I was there last year. The Spaniards make it the same way, but the canned tuna is often mixed in the salad rather than being placed on top. Some versions have olives, roasted red peppers or asparagus spears arranged on top in an attractive design or just plain with boiled eggs around the edge of the bowl. Making it with my mother, we never weighed our ingredients, but the following combination and ratios should please anyone’s palate. 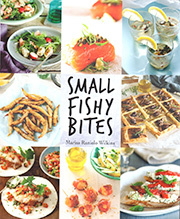 This recipe (and the photos of the pages in the book) are from my second book – Small Fishy Bites. Cook potatoes and carrots in their skins in separate pans; cool, peel and cut them into small cubes. Cook the peas and beans separately; drain and cool. Hard boil the eggs; peel them and cube 2 of them. Cut the giardiniera into small pieces (carrots, turnips, cauliflower, gherkins). Mix all of these ingredients together with a cup of home made egg mayonnaise. Level out the Russian salad either on a flat plate or in a bowl and leave in the fridge for at least an hour before decorating it by covering it with the remaining mayonnaise. Have a good old time placing on the top slices of hard-boiled eggs, drained tuna or small cooked prawns and caviar. Bits of giardiniera will also add colour. Mix 1 egg with a little salt in the blender food processor, or in a clean jar (if using the wand). Slowly add 1–1 ½ cups of extra virgin olive oil in a thin, steady stream through the feed tube while the blender or processor is running, Before adding additional oil, ensure that the oil, which has previously been added has been incorporated completely. Add a tablespoon of fresh lemon juice when the mayonnaise is creamy. If you are not making the traditional Italian version, it is common to add vinegar instead of lemon juice and a teaspoon of Dijon mustard. As an alternative, the Spaniards like to add a little saffron (pre-softened in a little warm water). Add this once the mayonnaise is made. We now have Australian capers growing on the dry rocky slopes of the River Murray. Some nurseries sell the seeds or plants and they are being grown in some home gardens. The caper buds need to be soaked in water for at least 2-3 days (apparently they have some bitter taste, like olives) and then are preserved under salt or under vinegar. Spring in Sicily is welcomed ‘big time’ and spring produce is embraced. Sicilians make a fuss about the preparation and eating of seasonal spring produce: asparagus, artichokes, broad beans, fennel and ricotta. It is the time when the island comes alive – flowers bloom, vines sprout and vegetables ripen. The menu at Waratah Hills Vineyard was a celebration of Spring, and all who attended the class enjoyed all of that produce and the occasion in such a beautiful vineyard. We ate local garfish rolled around a Sicilian stuffing (commonly used for sardines called Beccafico), stuffed artichokes and a pasta with a dressing made from sautéed spring vegetables, moistened with wine and stock and topped with nutmeg and creamy ricotta. We drank excellent, matching wines with each course and used local, extra virgin olive oil made by Judy and Neil’s (proprietors of Waratah Hills Vineyard and organizers of this event) neighbours . A few dressed Sicilian Green olives at the start did not go astray (garlic, orange rind, chilli flakes, wild fennel fronds, bay leaves, extra virgin olive oil) and a fennel and orange salad as a palate cleanser eaten after the fish was a good choice . Thank you to all those eager and friendly people who made the event a success.